any one install a Cogeneration system in a multi family for domestic HW and Heat?? Don't know what's out there for small co-generation. But here's some info for internal combustion engine gens. On Onan generator site people talk about using old water cooled marine gasoline/diesel generators for heating, WHILE utility power is out or not available. Thing is a well made internal combustion engine may only get ~ 8,000 hours before wearing out and needing a $$ rebuild. 1 year has 8760 hours in it. Better $$$ engines may get ~30k hours, Northern Lights?? gens maybe. Snow blower type engines get ~ 300 hours. Here in NH over past 1 year my boiler ran 1143 hours ( has 1.1 GPH nossel), it makes DHW via tank coil. 1800 rpm engines last longer than 3600 rpm self destruct screamers. One problem is in summer won't need to run much for heating, so electrical output will come on/off frequently. My single family house boiler ran total of only ~ 50 minutes per day to stay hot for DHW coil in summer. if not selling power back to utility that will make lot of short run switching of transfer switch ( clocks will lose time). Know a engineer in Chelmsford Mass that has reduced pricing for nat gas in winter, he had a 7.5kw air cooled gen. Figured he could make electricity for 2 cent/KWH less than utility charged, if he ignored gen's purchase cost and cost of rebuilding engine periodically every ~ 8000 hours. He didn't do it. He did not plan on capturing waste heat, gen was 100ft from house, wanted it quite to sleep. If installed inside house CO poisoning exhaust leaks/rusting is a large concern, engines make high pressure exhaust compared to home furnaces. Easier to have outward leak. On cars pipes/muffler rusts, manifold bolts vibrate out, gaskets leak, manifolds warp, gens are likely same. Just to throw some numbers out there my air cooled 7kw Onan uses 1.3 GPH gasoline at full load. So that's a potential 137k BTU/hr between exhaust and cooling. Water cooled gen is likely the same. Problem is using 7kw is not easy, most non-electric houses don't need much power majority of the time , maybe 500-1000 watts. So want to sell it back to utility. Diesel engines use ~ 1/2 the fuel as gasoline ones for same power gen power output. Gasoline has long term storage problems with ethanol. Nat gas if have it is easy on engine oil, but want high compression pistons or engine makes less power than on propane/gasoline. Could use a miniature gas turbine but guessing bearings and gear reduction don't last. They don't in jet planes. Run your numbers but utility power plants with combined regeneration cycles might get a total PEAK efficiency of ~ 40% at FULL load, LOT less at partial load. I'ld plan on LESS for single stage turbine. Fuel cells have potential for ~80% efficiency (electrical), but don't know if costs have come down yet. Back in early 80's I think phosphoric acid fuel cell was " low" cost one, wanted H2, maybe cracked nat gas, had low life I think. Did R&D on few types for utility sized power plants. Years ago read of vapor fuel powered thermocouple generators, NASA project. Likely not commercialized yet. I think the numbers will only pencil out if you have a fairly consistent thermal load for the unit. The unit that Lochinvar is selling recovers energy at the cooling system, exhaust, & generator as I recall. Ad says it's a NEW product design, only 2-3 months old. I'ld be learry of new product with no reliability track record. In cars new designs can have problems , hate to be ginny pig testing out their reliability. I'ld feel more comfortable with gen design with proven record of long term reliability. Old Onan and northern lights gens have that good record. In my opinion less risk to take a proven reliability gen and add a heat exchanger on exhaust. I'ld look if it was 1800 or 3600 rpm engine, 3600 seem to have shorter than 1/2 life of 1800 ones. Yes steady state running would make for less wear and tear. Know a cheapskate that would shut off his car engine at every red light to save gas, when starter died he complained it only lasted 1/2 the life of everyone elses. The numbers likely also assume no labor cost for oil changes and filters, DIY. Likely for CO safty you want this outside, noise too. At some point Caterpillar had a line of diesels that ran on natural gas with 10% diesel, since neither propane nor natural gas will self ignite the diesel ignited under pressure and lit off the NG. This might be an interesting engine low fuel cost and diesel longevity. I've heard about those, think it was big gens running on landfill gas (low quality methane). Likely nat gas was injected into high pressure hot air in cylinder when engine wanted it to ignite, same as diesel fuel. I believe nat gas ignition temp is only slightly higher than gasoline, and propane is about same. Base on dificulty of igniting diesel fuel with a match I think it's ignition temp is LOT higher than any of these other fuels. Most engines can be made (engineered) to operate for 100,000 hours with today's tech. I believe Honda had designed a NG powered cogeneration unit. Let me see if I can find some info. The traditional longevity of a diesel engine is generally because it has to be built better to withstand the compression ignition and severe vibration which is inherent to the diesel cycle. Gasoline is gentler on an engine, Yanmar and Cummins both made gasoline versions of their Diesel engines which would run pretty much forever! I believe the bottom ends were the same only the head and pistons were redesigned to lower compression and swap injectors for spark plugs. I've heard about some diesel engines, Lister maybe, that last FOREVER. 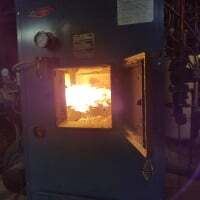 Hard to beat regular furnace on economics. Even old ones were ~ 85%, so not much energy left to save money on. There is some potential savings there, but after capital costs for gen, switching, shed and maintenance, likely only a few $ coins left to pocket. Has MUCH more potential IF your off grid. At best (full load) only ~ 17% of gasoline's energy ends up as electricity. Now, if you MUST make electricity (ei for an island or you are a power company) THEN co-generation is a GREAT idea to sell off waste heat that would otherwise be dumped, which is ~ 83% of fuel's energy (~60% if turbine gen). Europe's power plants did this, they piped waste heat in form of steam under city streets and sold it to homes for heating. To get higher efficiency will also need your house emitters to return a cooler temp water. Suppose could put a heat pump on exhaust but that adds cost and it's law of diminishing financial returns, not to mention corrosion. Another issue that reduces internal combustion (IC) engine efficiency is there is extra energy going out exhaust in form of unburned fuel: CO, and partially burnt hydrocarbons. So needs a $$ catalytic converter to fully burn and release that energy. Another negative if installed inside a building is CO safety. Boilers are adjusted to make very little ppm of CO and exhaust is at a slight negative pressure so leaks are into exhaust pipe. With IC engine CO is measured in tens of % and exhaust is at significant pressure ( ~ 50- 100 psi pulse at engine when valve opens). So leaks can easily be outward from exhaust. Catalytic converter can ~ eliminate CO and release energy once it's heated up to light off temp (~ red hot). Need CO detectors/alarm. 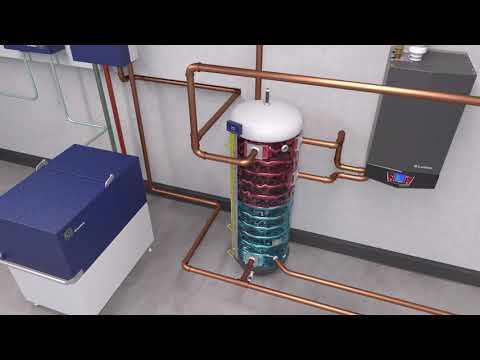 Lochinvar offers a 24kW/163KBtu micro cogen that is designed for multi family type applications. In addition, Lochinvar can provide back up heaters, storage tanks, etc.